Appalachian Agency for Senior Citizens AllCARE for Seniors PACE participants were big winners are the Russell County Fair. 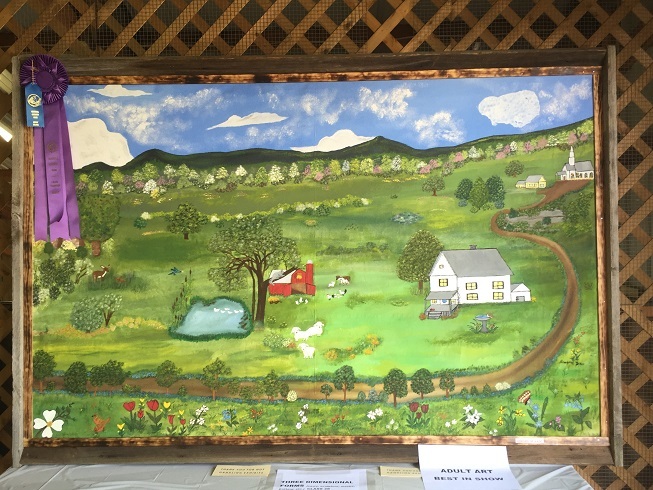 The participants worked diligently on a beautiful hand painted canvas that snagged not only the first place ribbon, but the Grand Champion ribbon at the Russell County Fair art show. The participants designed and completed the canvas during their time in therapy at the Adult Day Care facility in Cedar Bluff with the assistance of Cindy Smith, Certified Occupational Therapy Assistant and the PACE therapy group. Occupational Therapy is a perfect setting for this type of exercise because painting uses techniques to engage the patient while exercising their cognitive, visual and sensory skills. Cindy has worked diligently with PACE participants to expand their artistic abilities and showcase their unique talents. “We are thrilled to be able to share the talents of our amazing seniors with the community. Often times, the unique abilities of our area seniors are forgotten. I am so proud of the staff for their unending encouragement to our seniors, urging them to continue their hobbies and finding venues to showcase their amazing works. Working with the PACE participants is one of the greatest blessings because every day they teach us all something new.” stated Regina Sayers, Executive Director of AASC. AllCARE for Seniors is a Program of All-Inclusive Care for the Elderly (PACE) under the umbrella of Appalachian Agency for Senior Citizens. PACE is a long-term care solution for individuals who need help taking care of themselves at home. PACE programs provide health care and social services for older adults who need nursing home services but want to continue living with in their homes and communities. For more information concerning AllCARE for Seniors PACE, please contact 276.964.4915.